Modernist Jewelry - This is a unique cuff bracelet style that is meant to be worn low on the wrist towards the hand, but can be worn high on the arm as an arm bracelet. 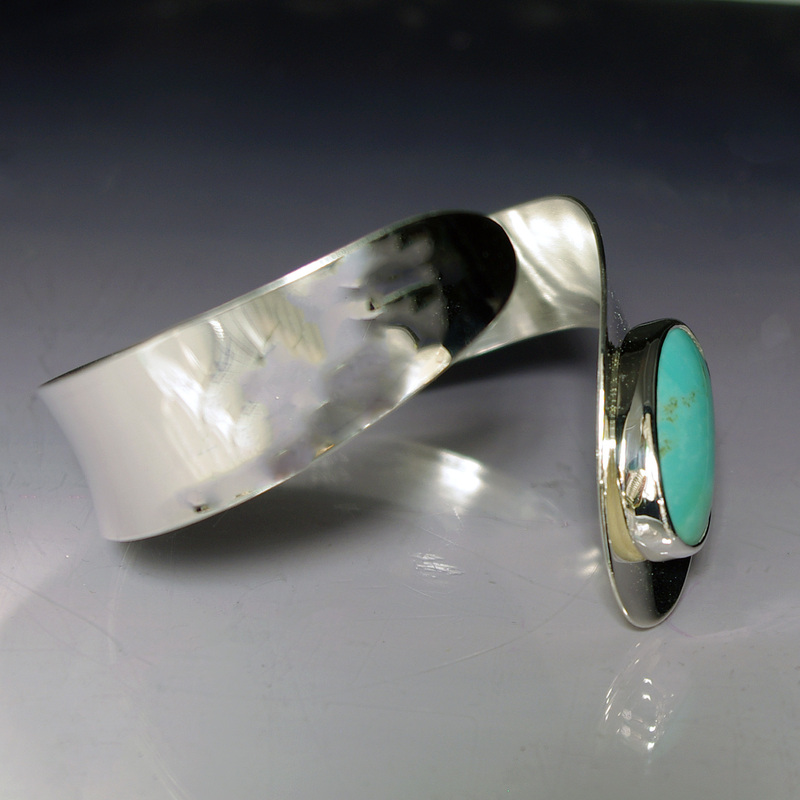 This 18 gauge cuff features a natural freeform light blue turquoise cabochon. This is a modernist style cuff bracelet that is comfortable and fun to wear. The bracelet can be worn low on the wrist towards the hand or high on the arm as an arm bracelet. 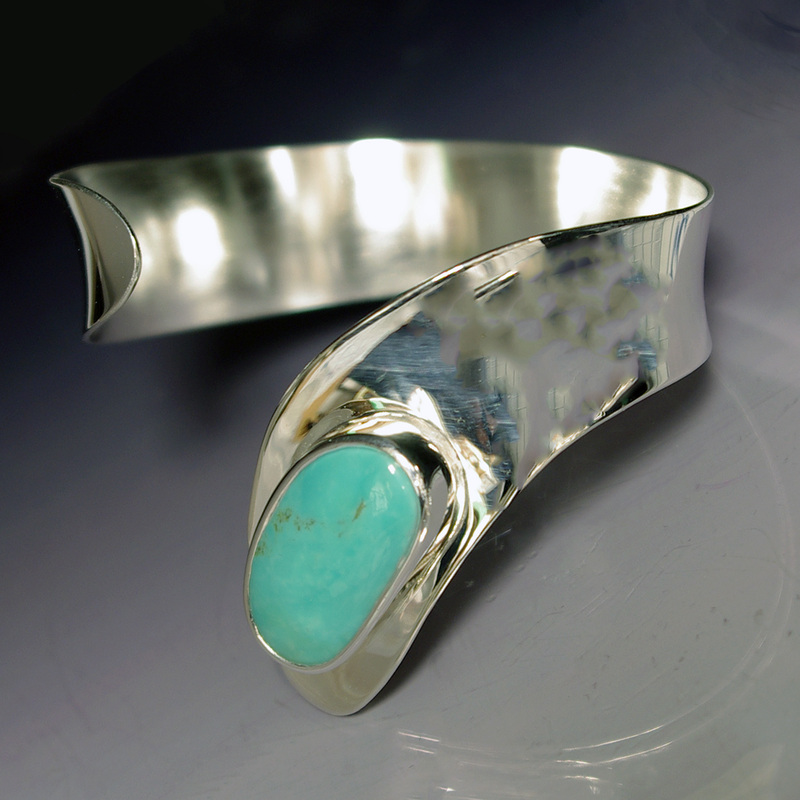 The cuff features a natural free-form turquoise cabochon which is fully bezeled in sterling silver. The bracelet is high polished and is constructed from 18 gauge sterling silver. This bracelet is handmade in our studio and may vary slightly, but our attention to detail ensures that you are wearing a one of a kind high quality bracelet. This is a truly unique piece that is designed, created, and signed by Aaron Rubinstein and Modern Art Jewelry. The Bracelet approximately is 1.7" wide in the front and .57" in the back. The Turquoise is approximately 1" long x .56" wide (25mm x 14mm).